This text is the collective statement of the participants of the 8th Balkan Anarchist Bookfair (BASK) in Mostar which took place at the beginning of September, 2014. It is an important statement in light of recent and seemingly rising apologetics among anarchists and the anti-authoritarian left regarding nationalism. It is clear that nationalism is a tool used against the exploited classes. In the Balkans, (especially in the region of ex-Yugoslavia) the rise of nationalist ideology in the 1990’s helped enable the brutal capitalist attack against society. It further atomized the population and destroyed established networks of cooperation and solidarity. The need to confront nationalist ideology from a radical and anti-authoritarian perspective gathered us in Mostar on the 5th and 6th of September 2014, for the 8th Balkan Anarchist Bookfair. We came from Bosnia and Herzegovina, Croatia, Serbia, Slovenia, Albania, Romania, Greece and other countries outside the Balkan area. 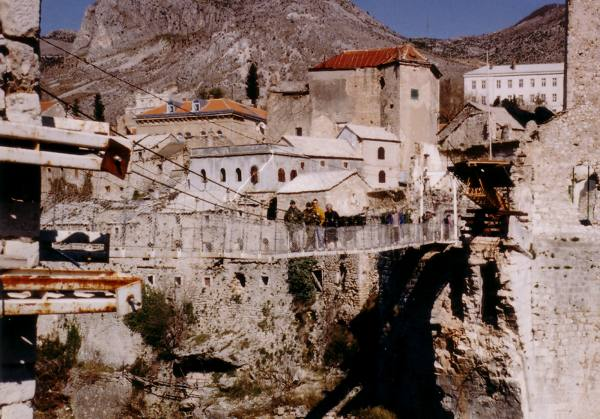 The true nature of nationalism is nowhere more obvious then in Mostar, a city divided in two, with the signs of wartime brutality still evident in the streets of the city. It is essential to realize that this division was not the cause of war, but the consequence of wars and nationalist ideologies created by the ruling class. This was clear to the demonstrators in Tuzla who wrote the graffiti “Death to nationalism” as well as to demonstrators in Mostar who burned down the headquarters of both nationalist parties in February. Still, in other parts of the world new nationalisms and conflicts are being created on similar lines and with predictable consequences. Many in the Ukraine today think they have to respond to the false choices of war posed by states and corporations (amongst them are even some anarchists and “anarchists”. We, however, maintain that nationalism is always an ideology that reproduces the State, a system of repression and exploitation, and pits the exploited and oppressed against one another. Today we see in the Ukraine the same mechanism that was used also in the war(s) in former Yugoslavia: Nationalism is the tool of those in power to push people into war for the interests of capital. As anarchists, we opposed all war efforts in former Yugoslavia through solidarity that continues to this day. Far from liberal pacifism or obsessions with left-nationalist guerrilla armies, our struggle will never take the side of militarist politics and the destruction that all states are based on. Against nationalism, militarism and war! Against all governments and states! For solidarity and autonomy! Nationalism is always an ideology that reproduces the State, a system of repression and exploitation, and pits the exploited and oppressed against one another. That made my day! Thanks! Added it to the post, thanks!